Snippets of Jack: "I Ain't No Ghost"
If you haven't read The Pirates of the Caribbean: The Price of Freedom by A.C. Crispin, then you're really missing out because it's one of the best books I've read. So, if you are one of these unfortunate people, then I give you two options: stop reading this post because there are spoilers and read one of our other awesome posts OR read this awesome posts and find out all about one of my favorite characters, Chamba. At the beginning of the novel Chamba is a slave working for a man named Mr. Blount who sells provisions to the East India Trading Company Ships in Calabar in the northwest coast of Africa. Mr. Blount is a cheater. 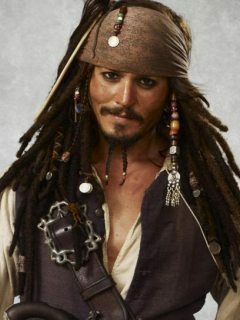 He gives Captain Jack Sparrow, the Captain of Cutler Beckett and the EITC's boat, the Wicked Wench, very bad provisions for his ship with a good layer of provisions ontop in hopes that no one will notice until they are far out at sea. But Jack, of course, is too smart for him and checks before leaving the port. He goes down to the provision warehouse to have a talk. Mr. Blount: "The Wicked Wench? 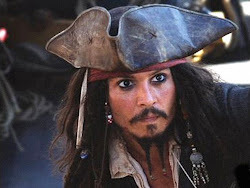 Why I dispatched the first lad of provisons just to her today, Captain Sparrow. You didn't receive them?" Jack: "I brought them back, Mr. Blount, is what I did. And unless you immediately furnish me with my full stowage of clean flour, and vermin-free biscuit, plus salt beef and pork that won't run through a man like seawater through a breached hull, my men are going to take these barrels up the street to Mr. Beckett's office and take them inside. And then perhaps, we'll tell Mr. Beckett where they come from, just before we spill them on the floor, eh, mate?" Captain Jack is taking charge! Of course, Mr. Blount isn't very happy about being caught but he gives Jack the fair provisions anyways. He then blames Chamba for the "mistake" and beats him nearly to death later. Chamba is smart though. He pretends to be dead and when Mr. Blount is gone, he runs away. He finds the Wicked Wench and climbs onto the window of Jack's cabin. Jack at first thinks its Chamba's ghost coming to haunt him. Chamba: "Cap'n Sparrow? Please, help! I ain't no ghost, I'm me. I be hanging here, outside the window." Jack, who avoids participating in slavery or the slave trade, pulls Chamba into his cabin and cares for his wounds inflicted by Blount. Afterwards, Chamba requests for his freedom. Chamba: "Going with you, Cap'n, please. Stay here, on the ship. The ship, she be free. Your sailor men, they free. Me, I want become like them. A sailor man. Learn the sailor trade. Sail far away from here." So Jack agrees to hire Chamba secretly but Chamba must hide until they leave Calabar so he doesn't get recaptured. Jack is so clever that even when Mr. Blount and slave hunter come on board the Wench in search of the runaway, they don't find him. Chamba stays hidden until Jack instructs the crew to make port at St. Jago, an island off the coast to get more supplies. Jack then pretends that while he's there he hires Chamba to be a cabin boy. No one except Robby Greene, the first mate, knows where Chamba truly comes from. Chamba proves to be great help to Jack as he helps in the "escape" of Ayisha and her brother, Shabako. Chamba becomes such good friends with Ayisha and Shabako that when the reach the secret island of Kerma, Chamba tells Jack that he will stay behind in Kerma, and of course Jack is sad to see Chamba leave.